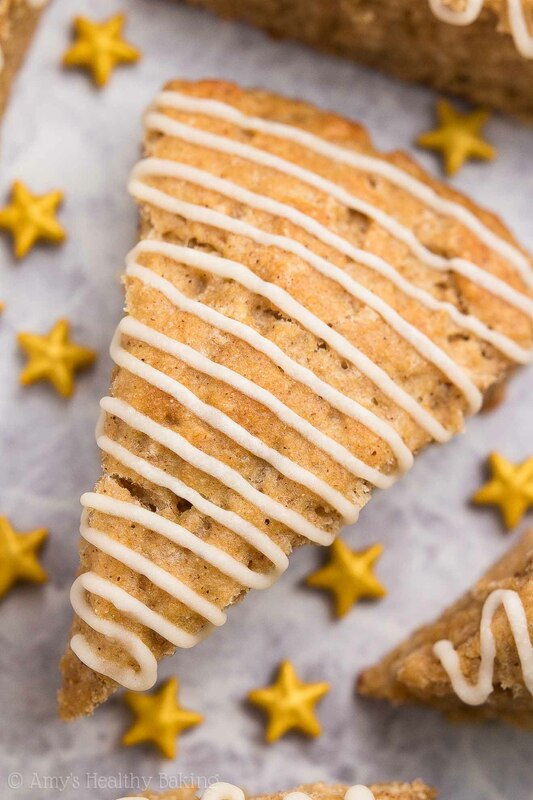 An easy recipe for tender scones full of spices & eggnog flavor, then topped with a sweet eggnog drizzle! Ready in 30 minutes & only 126 calories! On the Saturday after Thanksgiving, I asked my family if they were up for a spur-of-the-moment trip to our favorite brunch restaurant. Without a moment of hesitation, everyone agreed—including Dad, who had just polished off a huge post-hike snack! An hour later, after driving out to the peninsula fairly close to the San Francisco airport, we snagged a table towards the back of the restaurant in our favorite waiter’s section. He quickly came over to greet us with a big smile and hugs for my mom and me, and we traded stories for a few minutes before placing our order. Although everyone except Dad tends to order the same thing every time (he normally branches out and picks the most interesting new item on the menu! ), I still glanced at their seasonal specials. The kitchen had already jumped straight into holiday flavors and offered fun treats like Mexican peppermint mochas, cranberry coffee cake, and eggnog pancakes. I still opted for my usual, same as Mom: steamed veggies and eggs, with sides of country-style hash browns (those thick potato chunks, cooked until brown and crispy on the outside and supremely soft on the inside… yum!) and a towering slice of blueberry coffee cake with a thick layer of cinnamon streusel on top. 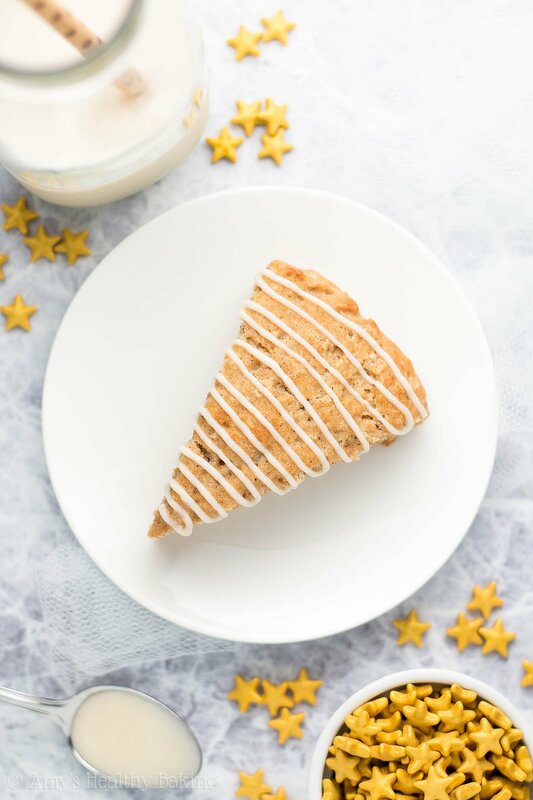 That coffee cake is the main reason we go—it’s the best we’ve ever had from any restaurant or bakery! 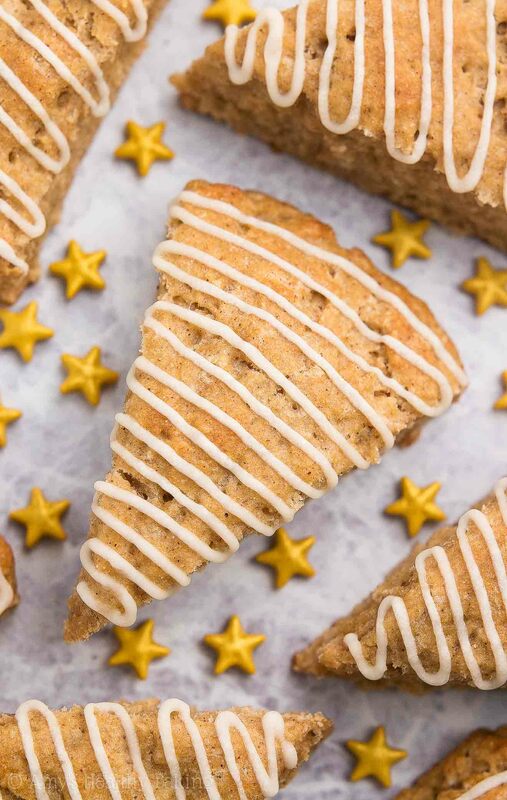 Yet when I flew back to San Diego, I just couldn’t shake the thought of those eggnog pancakes from the restaurant menu… But because I’m too lazy to stand over the stove dolloping and flipping batter, I decided to use that fun holiday flavor in a different breakfast treat: these Healthier Eggnog Scones! They’re incredibly tender—no dry, crumbly pastries here!—and full of spices and festive eggnog flavor. However, they contain no refined flour or added refined sugar, and they’re just 126 calories! 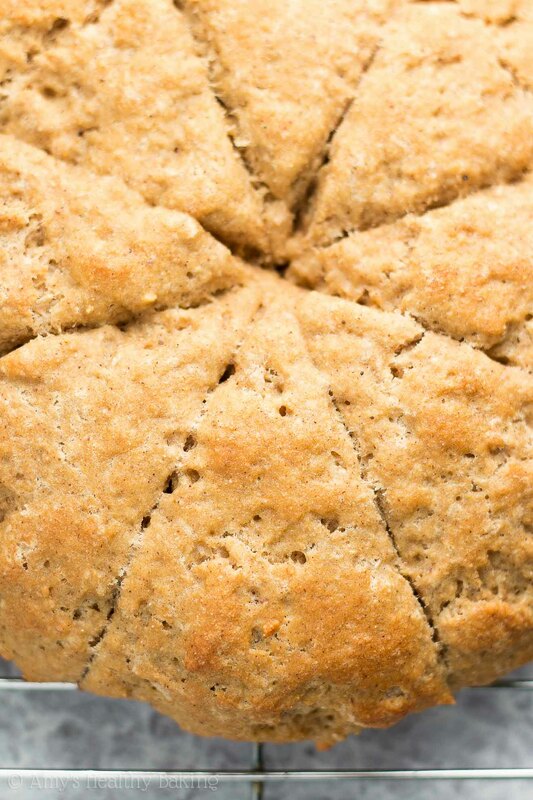 To make these scones, you’ll start with white whole wheat flour (like this! ), cinnamon, and nutmeg. It’s impossible to make anything eggnog-flavored without those spices! Mom always sprinkles fresh nutmeg on top of her eggnog, and I’ve found that nutmeg really enhances the eggnog flavor in baked goods, too. As for the white whole wheat flour, such a thing actually exists! And it’s not a combination of white (aka all-purpose) flour and whole wheat flour. White whole wheat flour is made exactly the same way as regular whole wheat flour and has all of the same health benefits (like extra fiber!). The only difference? Regular whole wheat flour comes from a heartier variety of red wheat, whereas white whole wheat flour comes from a softer variety of white wheat (hence the name!). 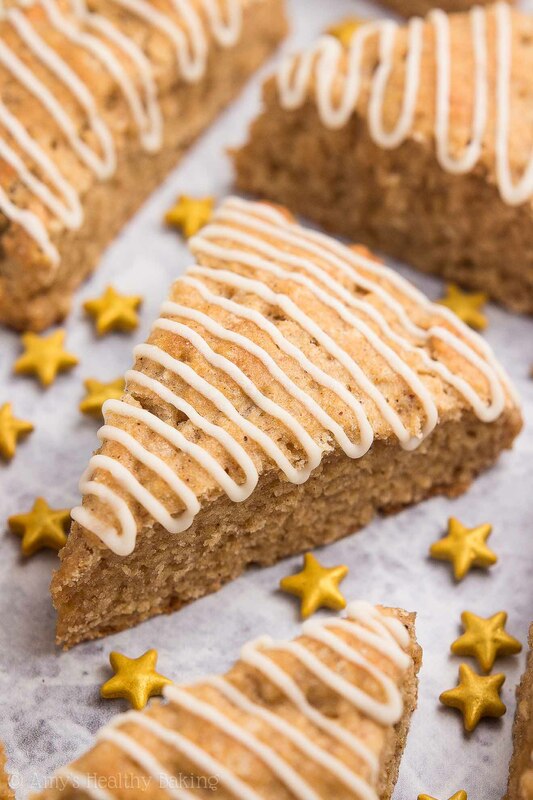 This gives white whole wheat flour a lighter taste and texture, which is perfect for letting the eggnog flavor and tender texture of these scones shine! It’s extremely important that your butter is cold, straight from the fridge. (Freezing isn’t necessary for this recipe!) When the butter melts in the oven, it creates little air pockets in the dough, which gives your scones their supremely tender texture. If your butter begins to soften or melt too early, while you’re still mixing up the dough, you’ll miss out on that! Note: This is why I strongly recommend not substituting coconut oil. Coconut oil melts at room temperature, so it’s nearly impossible to keep it cold enough to create the perfect texture! Now for the most important ingredient… The eggnog! Although I know it’s perfectly safe to drink the raw eggs in eggnog, I still feel a little weird about that… So I always buy non-dairy vegan “eggnogs” instead! This is the one I absolutely love. It tastes incredible, and even Mom says its flavor is basically the same as traditional eggnog! Even better? That non-dairy vegan “eggnog” has less than half the calories as traditional eggnog! So that really helps cut down on the calories and fat in these healthier scones. How incredible do those guilt-free holiday pastries look?? ?⛄️ And when you make your own, remember to snap a picture and share it on Instagram using #amyshealthybaking and tagging @amyshealthybaking IN the photo itself! (That guarantees I’ll see your picture! ?) I’d love to see your scones and feature them in my Sunday Spotlight series! 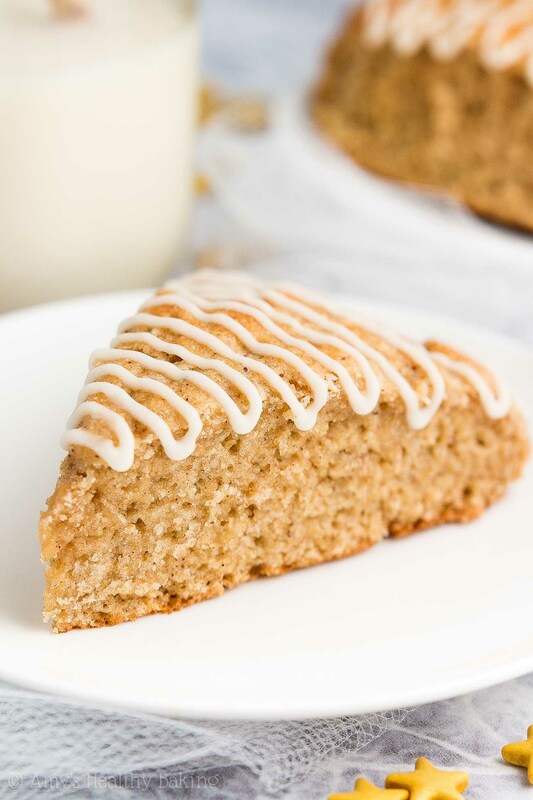 These scones are always a huge hit with my family, especially my mom… She’s the biggest eggnog fan I’ve ever met! 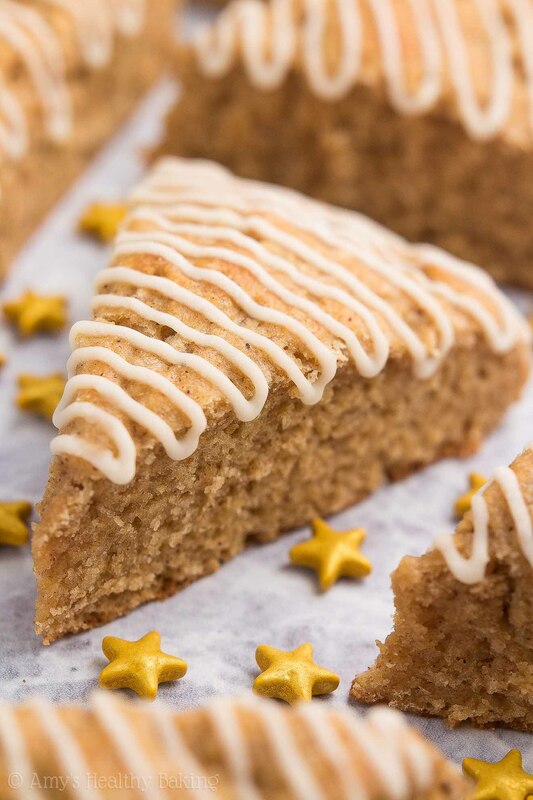 The scones are supremely tender, full of spices, and bursting with eggnog flavor. They’ll keep for at least 5 days if stored in an airtight container in the refrigerator (if not longer!). To prepare the scones, whisk together the flour, baking powder, cinnamon, nutmeg, and salt. Cut in the butter with a pastry cutter (highly recommended!) or the back of a fork until the mixture resembles fine crumbs. Make a well in the center. Add in the Greek yogurt, ¼ cup of eggnog, maple syrup, and vanilla extract. Stir until just incorporated. Using a spatula, shape the dough into a ¾” tall circle on the prepared baking sheet, and brush with the remaining eggnog. Slice the circle into 8 triangular segments with a sharp knife. (No need to separate them!) Bake at 425°F for 18-21 minutes, or until the tops are lightly golden. Cool on the pan for 5 minutes before transferring to a wire rack. Just before serving, prepare the drizzle by stirring together the confectioners’ style stevia and eggnog in a small bowl. Transfer the mixture to a zip-topped bag, cut off a tiny piece of one corner, and drizzle on top of the cooled scones. For a vegan version, I recommend Earth Balance sticks in place of the butter and your preferred non-dairy yogurt in place of the Greek yogurt. In the drizzle, regular confectioners’ (powdered) sugar may be substituted for the confectioners’ style stevia. However, it is more absorbent, so start with ½ teaspoon of vegan “eggnog” or light eggnog and add more as necessary to achieve the desired consistency. I like your families style. Your dad is always up for a meal, and you and your mom pick DELICIOUS dishes!! 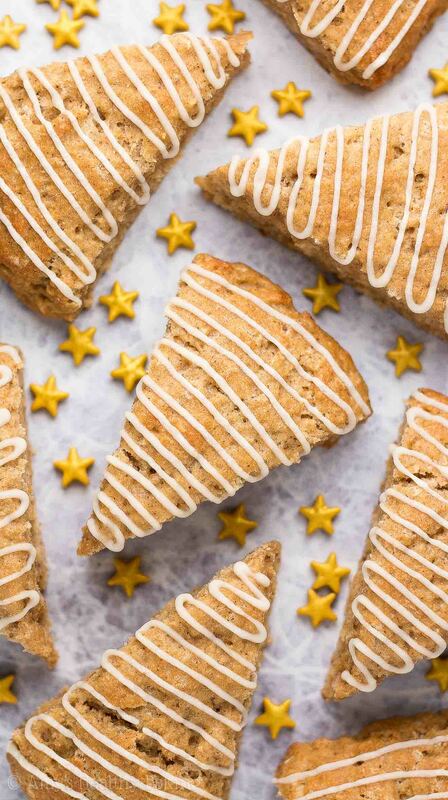 These scones are perfection.